To access this premium content you need to sign-up to Container Insight Weekly as part of the registration process. Container Insight Weekly is an online publication focusing on box shipping supply and demand dynamics globally. Articles are published online every Monday morning and provide shipping executives with the latest proprietary research, trade route analyses and expert opinions on the container shipping market. Charts, tables and short commentaries provide rapid snapshots of supply, demand, utilisation and freight rates by trade, vital to shipping executives who need to monitor market changes quickly and see the key numbers. Each weekly edition of Container Insight Weekly includes either an analysis of the supply and demand fundamentals of a major East-West and North South trade route and their impact on freight rates or a lead article covering a "hot" industry topic. Our experienced industry professionals have been providing analysis for decades via a variety of detailed monthly, quarterly and annual trade reports. 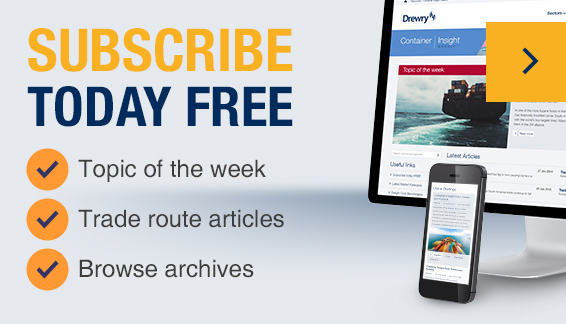 Container Insight Weekly draws on Drewry’s proprietary research and extensive databases and seeks to assess the impact and meaning of market changes. Spot market freight rate data is provided by the World Container Index assessed by Drewry, and from Drewry’s Container Freight Rate Insight. Monthly container traffic data is derived from Container Trade Statistics Ltd. (CTS), after which Drewry makes some adjustments for varying geographical scope. At the start of each month Drewry takes a snapshot of all East-West liner services and calculates the average nominal teu capacity of each service based on the assigned vessels taking into account any missed sailings. The nominal average capacity of each service is then adjusted for wayport calls (vessels calling at an intermediate non-core port on an end to end service where cargo is either discharged/loaded or transshipped for other out of scope destinations). The adjusted service capacity is then aggregated by trade route, after which further capacity adjustments are made for trade-specific factors such as deadweight and high-cube restrictions. The monthly trade demand sum in teu divided by the monthly supply sum in teu. The Drewry Global Port Throughput Index is based on average growth in throughput across approximately 120 ports globally. The base index of 100 is indicative of container traffic handled by these ports in January 2008. The regional throughout indices are based on average growth in container throughput across selected ports in a region.